Home / Stock Picks / Stocks to Sell / Should You Try to Catch the Falling Knife That Is Tilly’s Stock? Some stocks have done badly during the recent market selloff. Other stocks have done worse. And then there’s Tilly’s (NYSE:TLYS) stock. The teen-clothing retailer was once a beneficiary of the big retail recovery rally that started in late 2017 and lasted throughout the first half of 2018. During that stretch, TLYS stock more than tripled, surging from $8 to $25. But the $25 high that Tilly’s stock reached in early September proved to be fleeting. Since then, broader economic growth concerns and some problems with Tilly’s margins have caused TLYS stock to tumble. Last week, after reporting mixed third-quarter numbers and providing weak holiday-quarter profit guidance, TLYS trades at just over $12, less than half of the price of TLYS stock three months ago. At this point, it’s safe to call TLYS stock a falling knife. Usually, falling knives should be avoided. But, every once in a while, falling knives turn into big rebound plays. Could Tilly’s stock be in that category? Perhaps. But not just yet. While the company’s top-line numbers remain impressive and reached a five- year peak, there are some serious red flags when it comes to the company’s margins. Those red flags cloud the profit outlook of TLYS. Until investors have more certainty about the level of the company’s profits in a few years, TLYS stock won’t easily stop its tailspin. For those who are unaware of TLYS, it’s a largely off-mall, teen-oriented retailer that sells surfing, skating, and lifestyle apparel. This line of apparel used to be the hottest fad in fashion. That was back in the earlier 2010’s when Tilly’s was a growth machine. But, as it always does, the fashion trend changed, and it didn’t change in Tilly’s favor. Athleisure became trendy, knocking out surfing and skating styles. The athleisure trend has displayed incredible staying power over the past five years, so Tilly’s numbers haven’t been all that great during that stretch. That is why TLYS stock has fallen slightly from the level it had attained five years ago. But TLYS stock hasn’t dropped much over that period because, despite adverse fashion trends, there are many loyal surfing and skating fans. 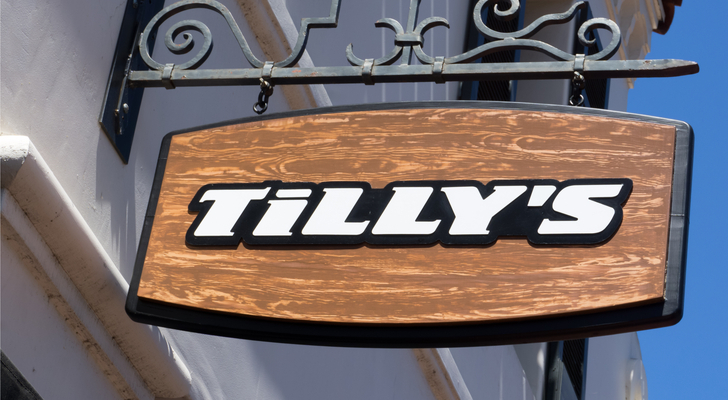 As a result, Tilly’s has been able to post decent numbers over the past several years, and those numbers are only improving as the U.S. consumer gets more confident and Tilly’s enhances its omnichannel presence. TLYS has now rattled off eight consecutive quarters of physical-store traffic growth. Its comparable sales were up 4.3% last quarter, following a 4.2% rise during the previous quarter. Those were its best back-to-back quarterly comps since the first half of 2012. Meanwhile, Tilly’s e-commerce business is finally starting to look appealing, and it’s growing at a 20%-plus rate for the first time since early 2012. Thanks to its improving comp sales, Tilly’s is also starting to open up new stores again. Overall, the revenue trends underpinning TLYS stock are good and only improving. If that was the end of the story, then Tilly’s stock would definitely be worth buying on weakness. But it isn’t the end of the story, and unfortunately, the other half of the story is much less favorable. The big problem at Tilly’s, and the reason why TLYS stock dropped so much after the company’s Q3 earnings were unveiled, is its margins. Over the past several years, TLYS has had fairly consistent gross margins and improving operating margins as its comparable sales growth accelerated into positive territory. But that is now changing in a big way. It turns out that the company’s revenue growth has become bad for its margins. The main factor weighing on its gross margins are its rising occupancy costs. Of course, that factor is exacerbated when TLYS opens more stores. Meanwhile, the big driver of Tilly’s growth today is its e-commerce business. Its digital sales rose nearly 27% last quarter, while the sales of its physical stores increased just over 1%. That was a major change from earlier in the year, when the revenue of its physical stores was rising more quickly than the top line of its e-commerce business. The latest trend is good because it shows that Tilly’s is finally aligned with the shift to e-commerce. But it’s also bad because e-commerce sales require the company to invest more in logistics and thus carry lower gross margins. So the two big drivers of this company’s revenue going forward (store openings and e-commerce growth) also create meaningful margin headwinds. That isn’t a great combination. It means that while the company’s revenue growth should be steady and healthy over the next few years, its margins are likely to drop. As a result, the long-term outlook of its profits is uncertain. Investors don’t like uncertainty, especially when it comes to profits. So until Tilly’s shows that it can grow its sales and stabilize its margins, TLYS stock will have difficulty bouncing back. Tilly’s is a strong retailer. Over the long-term, TLYS and Tilly’s stock will be just fine. But in the near-term, some huge concerns are weighing on the company’s profit outlook. Until Tilly’s margins stabilize and its profit outlook improves, TLYS stock will remain weak. Article printed from InvestorPlace Media, https://investorplace.com/2018/12/should-you-try-to-catch-the-falling-knife-that-is-tillys-stock/.